The Bourbon County Democrats believe in public education, fair wages, healthcare for all, job growth, and a healthy, clean environment. We fight for the causes of fairness, equality, and opportunity for all. We want our community to thrive and grow, and we support a quality of life for all Kentuckians. The future of our county, state, and nation depends on everyday citizens getting involved in the process of democracy. We encourage people to join us as we work together for the betterment of life for all. Your voice matters and helps bring change to this world. Please join us as we work for positive change. The Bourbon County delegates attended the Kentucky State Democratic Convention in June 2016. Our county party organization consists of the executive committee, precinct officers, delegates, and members. All positions except members are elected positions. We hold elections for executive committee members, precinct officers, and delegates every four years. Our last election process was in the spring of 2016, and the next election process will be in the spring of 2020. The executive committees acts a steering committee for the county party by managing the finances, organizing events, coordinating voter registration and get out the vote efforts, and promoting Democratic candidates. The positions on the committee are chair, vice chair, treasurer, and secretary plus voting members. The composition of the executive committee has equal numbers of male and female members. Precinct officers represent their voting precincts and vote in special elections on behalf of the county. Each precinct has a male representative, a female representative, and a youth representative (male or female under 35 years old). One of the three members serves as the precinct chair. Precinct officers are elected by members in each precinct. Delegates are divided into National Convention Selection Delegates and KDP (Kentucky Democratic Party) Leadership Selection Delegates. Both types of delegates are elected each presidential election cycle (every four years). The National Convention Selection Delegates are allocated according the proportional voting for Democratic candidates in our county. These delegates are elected by other members who voted for that same candidate. At the Kentucky State Democratic Convention, they vote on delegates, who filed paperwork to be candidates for the national delegation, to represent our state for each primary candidate at the Democratic National Convention. KDP Leadership Selection Delegates are elected by members county-wide. At the Kentucky State Democratic Convention, they vote on positions for the State Central Executive Committee. 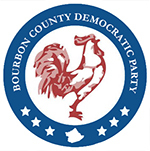 Members are registered Democrats who want to participate in activities and volunteer efforts of the Bourbon County Democrats. They contribute to our on-the-ground efforts during election cycles, and they help with events and fundraising efforts. Our goal is to host several county-wide meetings per year. We want to be accessible to everyone, and we want to keep you up-to-date on our efforts for voter registration, events, and fundraising. The executive committee meets regularly to discuss business matters, plan county-wide meetings, prepare for events, and determine other actions needed to help increase our outreach and support candidates. Our meetings will be posted on the Events page and promoted on our Facebook page. Until the 2018 Kentucky primary election, Bourbon County Democrats will not endorse any primary candidate. After a candidate is elected in the primary, we work hard to promote that candidate through on-the-ground efforts in our county through canvassing, phone banking, advertising, and events. Donations made to Bourbon County Democrats go toward administrative costs, events, and advertising for events and candidates. Donations are limited by fiscal year contribution caps per person, and we have to collect certain information with each donation. If you’d like to make a donation, please visit our Donate page and follow the instructions.